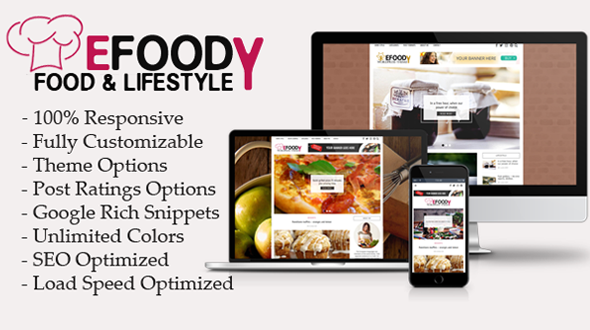 Efoody is a clean and elegant WordPress Theme with a focus on your content and was designed with food, recipes, health, lifestyle blogs in mind, but can be used for anyone who wants to have a beautiful wordpress site.It follows the trendy design with a combination of elegance. The theme can be customized easily to suit your needs, also it has full list of elements and a lot of short codes to build your website quickly and professionally. The theme was designed to be used easily of the beginner WordPress users without code knowledge. Efoody theme has a powerful admin panel that gives you full control to modify and customize styling, layouts, colors, background, logo, slider, etc. The theme package includes demo content files. You can import the demo content and your theme will look like the demo.